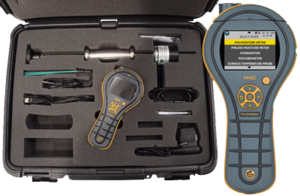 The MMS2 Restoration Kit comes complete with everything you need to detect, measure and monitor moisture in the restoration environment. Featuring the all-new MMS2 moisture meter, the Kit provides complete moisture detection and measurement capabilities, sub-surface moisture migration detections, full hygrometer features and data logging capabilities. Easily and accurately evaluate wood, wood floors, gypsum, concrete, plaster, cinder block, and much more. • Hammer Probe: Allows user to penetrate into structural materials like sub floors and framing to a depth of 1.38 in. (35 mm). The insulated pins determine the exact moisture content at depth. Includes four replacement pins. • Quickstick sensor measures ambient temperature and humidity with industry-leading speed and accuracy. • HD MC Probe attachment with cable for testing difficult-to-reach areas. • Deep Wall Probes. 5 in. (127 mm) probes allow you to measure moisture in drywall, wall cavity insulation, concrete, stucco, plaster, masonry, and other building materials. • Data logging software. Install on your PC to manage date, create reports, safely backup project records. PC only. Includes USB cable. • Sturdy carry case. Hard plastic case organizes and protects your sensitive moisture detection tools. Snap-lock fittings secure the contents during transporation and storage. Sturdy pre-cut foam inserts hold instruments and accessories firmly in place. Rugged, lightweight and ergonomic meter case. Log up to 1000 results, each with date and time stamp from all instrument functions.